Happy and AWE-some Holidays! Tall Trees is being reformated and redeveloped for the new year. In honor of the season, we’re giving away the full e-book, Activities that Inspire Mindfulness, Contemplation, Creativity, Compassion, Deep-Thinking, and Awesomeness in Young People. We want to grow a community of parents, teachers, leaders, and thinkers who are devoted to not only raising smart kids, but deep kids. 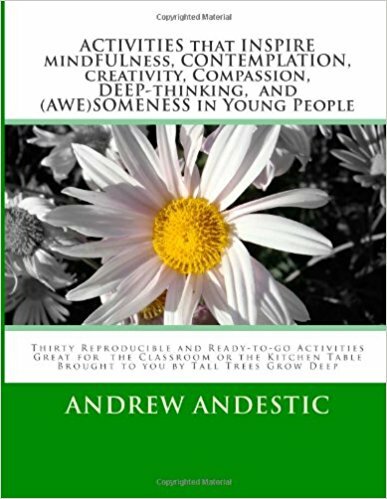 The book is a fully printable, reproducible pdf-formatted workbook of all of our best classroom or kitchen table activities, great for getting your kids (and your adults) to think deeply, contemplate life, be mindful, and grow awesome. You are welcome to buy a hard-copy on Amazon here. But, to be honest, the e-book is more practical because you can print out copies of the specific activities you want to use. Just click the link and it’s yours.